Joseph and Esther Koch lived in Ohio. 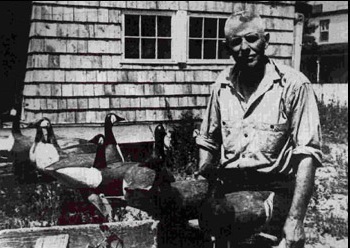 They discovered Ocracoke many years ago, sometime after World War II. 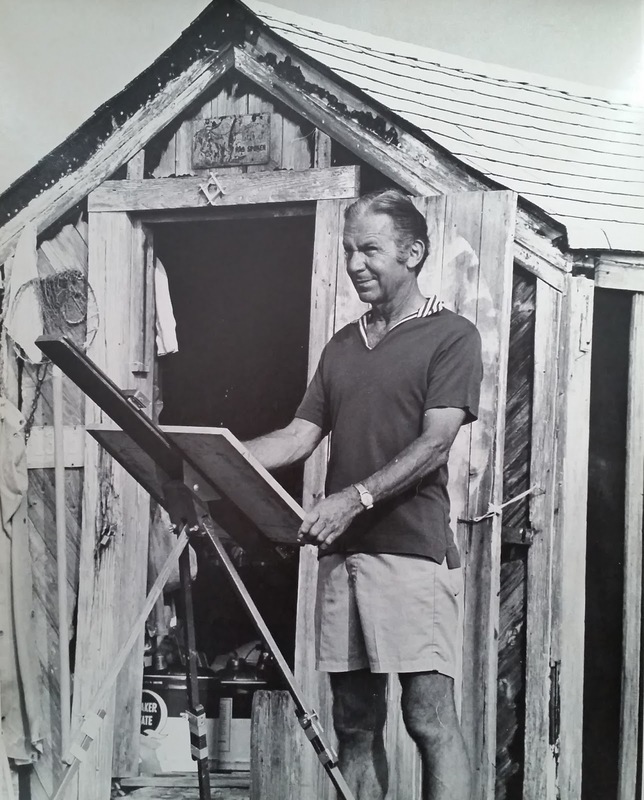 Joe was an artist, and he made many pencil sketches of Ocracoke village, the beach, and colorful island characters. He signed his drawings "JoKo." In the 1960s Joe and Esther purchased property on School Road (where Deepwater Theater and Books to be Red is located today) and on the corner of School Road and Highway 12 (where Spencer's Market is today). Esther died many years ago. Joe died in March of 2012, just short of his 105th birthday. In December of 2015 Ocracoke Preservation Society published an on-line exhibit featuring JoKo and his art. 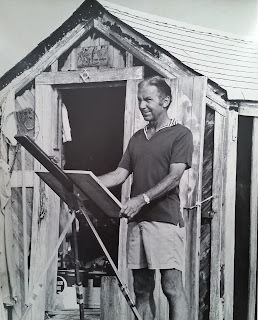 You can read the article and see examples of his work here: https://ocracokepreservation.org/december-online-exhibit-2015/. 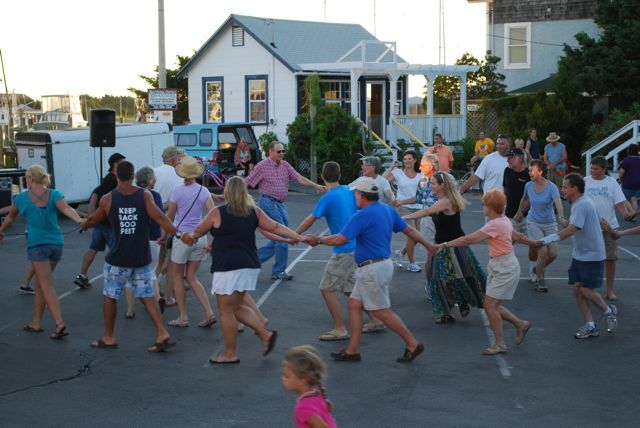 "Despite their comparative isolation, the people of Ocracoke seem normal in every way. I had expected to hear many localisms of speech and some Shakesperean English, but neither was noticeable [editors note: I don't know how that could have been possible in 1932!]. 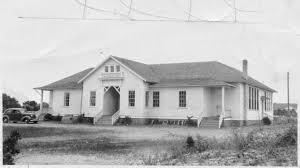 The local school, housed in a modern white painted building, includes the eight primary and grammar grades. For higher education than this, the pupils are sent to board at towns on the main land to attend the High Schools. Many go away each year and we were told that most of them, after attending the mainland schools for several years, find work on the mainland and return only for vacations and visits. Many drift to Baltimore and Philadelphia and other northern cities, as there is no livelihood other than fishing on the island." "We found the eastern North Carolinian very likeable. They resemble somewhat the eastern shore Marylander, which is natural, as they are from the same English stock with practically no dilution in either case. They are frank and friendly in a dignified way, make no apologies and ask no favors. 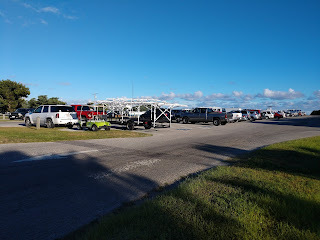 After having eaten too much, we left for Ocracoke at one P. M.
"It was still rough as we emerged from Core sound into Pamlico Sound, north of Harbor Island Light. Nothing but water could be seen to the west and north, and the ocean beach or banks of Portsmouth island extended faintly into the northeast. The husky Ocracoke ploughed steadily on, and at about 4 P. M. when about 5 miles from Ocracoke, we stopped near a fish oil factory, situated on a small low island, to exchange mail sacks with the mailman from Portsmouth, the village at the north end of Portsmouth Island. Portsmouth, consisting of perhaps two score of neatly painted small cottages and the usual prim white churches, lay on the sand half a mile away. There were few trees visible. An artesian well at the fishery was discharging a constant stream of sulphur water. The deep wells on the banks all produce sulphur water, and the shallow wells, brackish water. Rain water, caught on roofs, is carefully led to cisterns or tanks and is saved for drinking water. 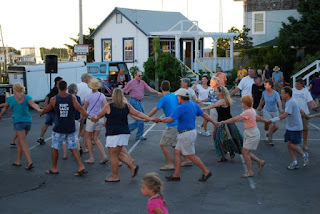 "A shoal lies just inside Ocracoke inlet with the deep water following close to the shores of both Portsmouth and Ocracoke Islands so we had to pass almost out to sea to get to Ocracoke; so close that we got the ground swell from outside. Shoals also lie outside and the channel in from the ocean, apparently lies between two so called interlocking bars. Although it is buoyed, it looks like a bad place for a stranger, for looking out to sea, there seemed to be breakers everywhere. "Here I saw my first Pelican. They are ungainly looking things as they cruise clumsily through the air, and when they dive for a fish, make a splash as large as if a horse had fallen overboard…." "There is little game on the island, but the village seems overrun with cats. Dogs seem to be scarce. We finally broke through the scrub to the beach and there a mile away was the ocean. 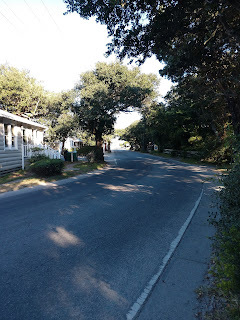 We returned to the hotel [Pamlico Inn], ate, and roamed further through the town. There were no street lights, and we were nearly run over several times by youngsters playing hide and seek. Later we sat outside the dance floor at the hotel and watched the younger element cut up. The hotel dances are a nightly performance. Everyone seems welcome. One youngster winds the Victrola and the rest dance, and tramp and stamp around. Tired, we took a last look out over the sound and turned in. The last thing I heard was the Victrola still going strong." "Fortified by breakfast, we started for the beach in the morning. Several wet spots stopped us, but while we were trying to find a way out, the hotel [Pamlico Inn] truck came by and took us over the mile-wide beach to the ocean. Wrecks and parts of wrecks are strewn along this beach, less than a hundred yards apart from end to end of the island. Most of them were old, some very old. It is remarkable how long a keelson of Georgia pine timbers bolted with locust trenails, will last before it weathers enough to rot. 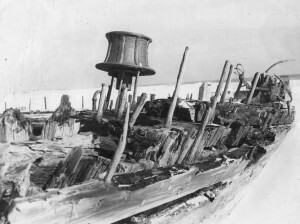 Judged by the bleaching bones of ships along these beaches, only two parts of a wooden ship seem strong enough to even partially withstand the surf – the keel and keelson assembly, and the topsides clamped at the deck. These parts are doubled and tripled and bolted through and through. However, there is a limit to their strength as there were no sections visible longer than fifty or sixty feet. Two days later we visited a fresh wreck at Nags Head, a four masted schooner lying in the surf with masts still standing." Post-hurricane Florence, with businesses closed awaiting a visitors re-entry notice, was a rare opportunity to catch up on chores we had been putting off since the beginning of the tourist season. It was also a chance to relax and enjoy the late summer weather. 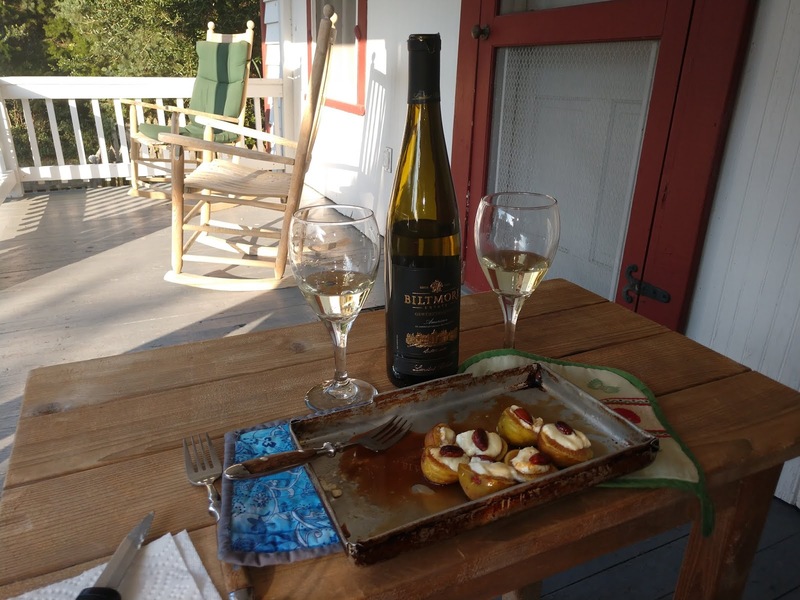 The last of our figs were ripening, and we decided to treat ourselves to a small gourmet delicacy before dinner...fresh figs and goat cheese. We cut the figs in half, topped them with a dollop of goat cheese and an almond. Then we dripped a bit of pure honey and a drizzle of balsamic vinegar over them. Into the broiler they went for a few minutes. We took the figs out onto the pizer with a bottle of Gewurztraminer wine and enjoyed our evening appetizer as we watched the sun cast ever longer shadows across the sandy lane. Island life is good even after a storm. Hurricane Florence has battered North Carolina, leaving a legacy of destruction, flooding, and death. The consequences of the storm are still being felt. We on Ocracoke, who know the power of hurricanes, are heartbroken over the misery Florence is causing for our neighbors to the south and west. This storm will not soon be forgotten. As many of our readers are aware, most islanders evacuated, but about 200 Ocracoke residents decided to ride out the storm. I was one of them. Some family, friends, and neighbors have asked why I decided to stay. To them it seemed like a foolish decision. As reply I penned a short essay, "Why I Stayed," which we have published as our September Newsletter. You can read it here: https://www.villagecraftsmen.com/why-i-stayed/. I hope I have conveyed my reasons for what I consider an informed decision. I might have been mistaken, but the situation turned out much as I hoped and expected. I won't second guess anyone else's decision. I hope others will respect mine. 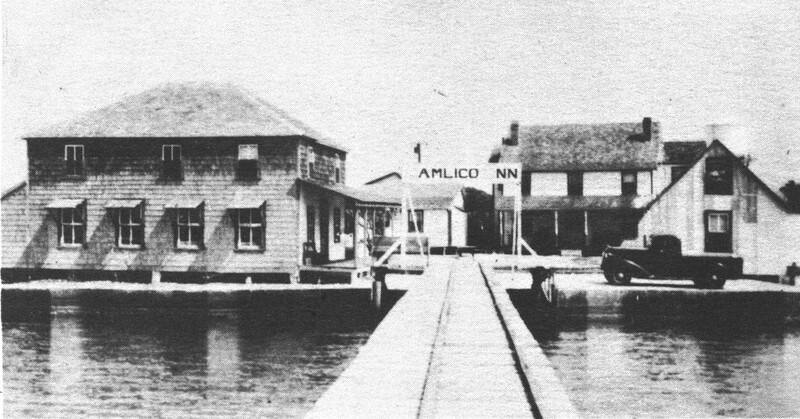 "Dropping our baggage [at the Pamlico Inn] and inquiring as to the supper hour, we tramped off toward the village. It has no streets, merely narrow roads of sand, so deep that walking in it is like walking a treadmill. The automobile has invaded Ocracoke and the horses have been turned loose to roam the sand dunes with the cattle. With a population of 500 there are 30 autos. The houses are mostly small, some one story and some two; some are evidently old and others have somewhat modern lines; some are well kept up and some are not. There is a salt water lake in the middle of the town and most of the boats are kept there. At the entrance to this lake is located the Coast Guard Station, which, with the lightkeeper’s house, has the only real grass lawn of the village. The Commanding Officer showed us through the station and explained the uses of his equipment, the several boats, the practice mast, and so on. In each of these stations a man in the tower constantly scans the horizon with a telescope." 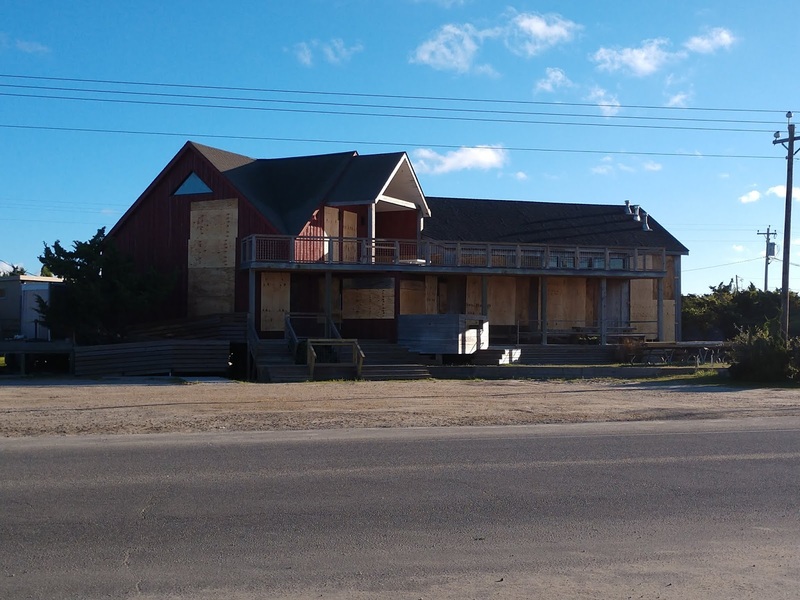 This month's Ocracoke Newsletter is the story of Mrs. Godfrey's ghost who haunts the Island Inn/Odd Fellows Lodge. The story is taken from Chapter Three of my book, Digging up Uncle Evans. You can read the account here: https://www.villagecraAftsmen.com/mrs-godfreys-ghost/. "The boats seen at Ocracoke are a gracefully sheered deadrise model with a fairly deep V bottom. All are built of white cedar (Juniper) which is cut in the swamps on the main land. These boats are built on the island. Ribs are spaced about two feet apart, with natural crook knees. The planking is an inch and a quarter thick and there is usually no chine. Also there is no curve to the fore foot although the stem rakes slightly. Two strangers, a high sided clinker built sea-bright dory, and a fairly large Chesapeake Bay bugeye, were seen among the local boats." 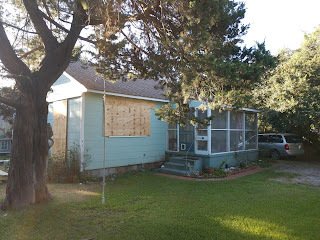 Ocracoke village was spared once again. Hurricane Florence made landfall far enough south of the Outer Banks that we only received tropical storm force winds and minimal flooding in the village. Nevertheless, there was significant overwash on the north end which covered Highway 12 with sand. It may be several days before that road is cleared. Yesterday, at 7 am, the Swan Quarter ferry resumed operations bringing emergency personnel, essential personnel, and residents back to Ocracoke. We anticipate that visitors will be permitted back on the island soon. Long-time readers of this blog know that we have been an important source of storm-related coverage and photos for many years. However, it has become clear that in these times Facebook does a better job of reaching more people with more information more quickly. That is why we directed our readers to the Village Craftsmen Facebook page for up-to-date Hurricane Florence news. Some of our Facebook posts reached 10,000 to 30,000 people, while a typical blog post would only reach several hundred people. We apologize to our readers who are not on Facebook, but I just didn't have the time or energy during the storm to post in both places. On the other hand, this blog continues to be the place to post short articles about the history, culture, and traditions of this very special island community. In our posts later this week look for stories about Ocracoke and our community in 1932, then even more insights into island life in the weeks ahead. We look forward to sharing more...especially since there was so little damage from Florence, and the village will be back to normal in short order! We hope you will be visiting soon. Heartfelt thanks to all of our faithful readers who let us know you were thinking about us and wishing us shelter and protection from the storm. We appreciate you all!! Many thanks to all of our readers who have sent us messages of concern. We appreciate them all! Just a few photos from this morning. 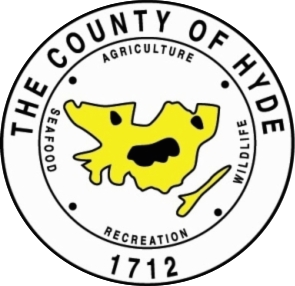 Effective at 12:00 pm, Tuesday, September 11, the Hyde County Board of Commissioners have extended the mandatory evacuation order to encompass all of Hyde County, mainland and island. There are no travel restrictions on the mainland at this time. We strongly encourage all residents to evacuate to safety. This storm is extremely dangerous and should be treated as such. The designated evacuation shelter for Hyde County residents is Knightdale High School, 100 Bryan Chalk Ln, Knightdale, NC 27545. This shelter is open to all Hyde County residents that wish to utilize it. The shelter will open on Tuesday, September 11 at 2:00 pm. The shelter is pet friendly and equipped to handle animals. We are currently looking for certified bus drivers to help with the evacuation of citizens to the shelter. If you can assist or know someone that can, please contact the EOC at 252-926-3715. The evacuation of Ocracoke residents and visitors will continue today, with all ferries currently running their regularly scheduled routes. Entry to Ocracoke is restricted to authorized personnel only. 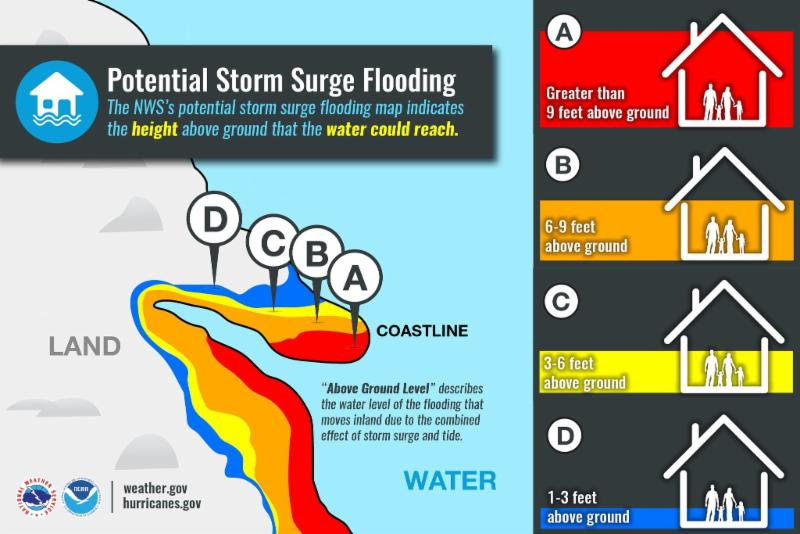 Current storm surge models are showing anywhere from 1-9 feet of surge depending on where you are located in the county, increasing from east to west. See picture below for a reference. County offices will close at noon, Wednesday, September 12. All alcohol sales will be suspended on the mainland at 5:00 pm Wednesday, September 12. For those without a means to travel to safety, Hyde County is planning to offer transportation and more information will be forthcoming. Officials are finalizing these plans and hope to release more details by Tuesday afternoon. If you have any questions regarding the evacuation, shelter or have any other special needs, please contact the Hyde County Emergency Operations Center at 252-926-3715. For those without a means to travel to safety, Hyde County is planning to offer transportation assistance and more information will be forthcoming. Officials are finalizing these plans and hope to release more details by Tuesday afternoon. If you have any questions regarding the evacuation or shelter, contact the Hyde County Emergency Operations Center at 252-926-3715. Effective at 5:00 am Tuesday, September 11, 2018, the Hyde County Board of Commissioners have issued a mandatory evacuation of Ocracoke Island for residents, non-resident property owners and the continued mandatory evacuation of visitors. All alcohol sales on the island will be suspended at 5:00 pm on Tuesday, September 11, 2018. At 12:00 pm on Monday, September 10, 2018, the Hyde County Board of Commissioners have declared a state of emergency for all of Hyde County and a mandatory visitor evacuation of Ocracoke Island due to the potential impact of Hurricane Florence. Hurricane Florence is projected to be a major hurricane with landfall somewhere in the southeastern NC area. 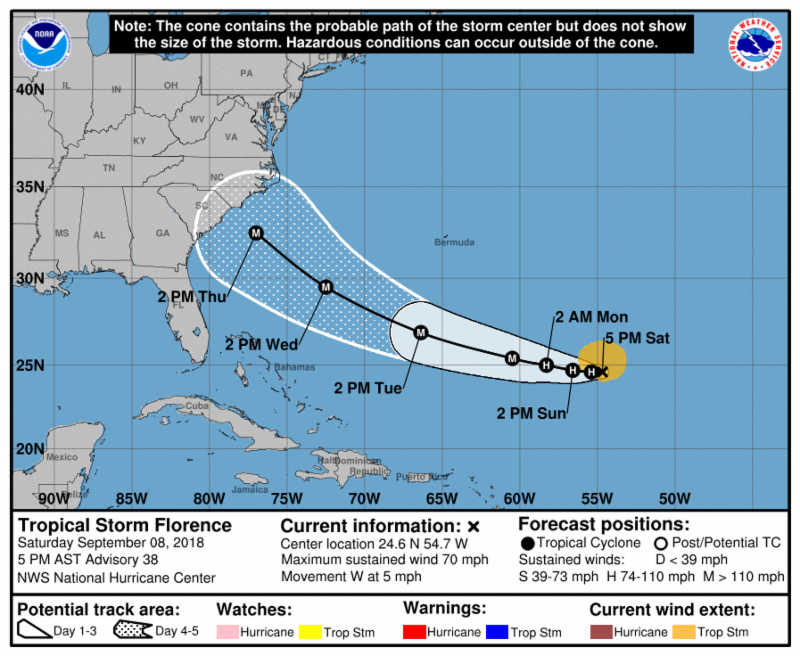 All of Hyde County is currently in the cone of uncertainty and current projections show the possibility of tropical storm force winds arriving as early as Wednesday evening. During a state of emergency, all NC DOT ferry reservations are canceled and tolls are waived. Boarding the ferries will be on a first come first serve basis. Due to the possible flooding and wash over on Hwy 12, impacts may occur well in advance of the storm, we recommend starting your evacuation as soon as possible and utilizing the sound route ferries when evacuating. Decisive action is necessary to insure you arrive at your destination safely. Effective at 12:00 pm Monday, September 10, 2018, the Hyde County Board of Commissioners have declared a state of emergency for all of Hyde County and a mandatory visitor evacuation of Ocracoke Island due to the potential impact of hurricane Florence. During a state of emergency, all NC DOT ferry reservations are canceled and tolls are waived. Boarding the ferries will be on a first come first serve basis. Due to the possible flooding and wash over on Hwy 12, impacts may occur well in advance of the storm, we recommend starting your evacuation as soon as possible and utilizing the sound route ferries when evacuating. Decisive action is necessary for Ocracoke visitors to insure you arrive at your destination safely. As our readers will no doubt realize, the major topic of conversation in the village today is hurricane Florence. Nearly everyone is making final preparations for landfall in North Carolina sometime on Thursday. I was waiting for an official local advisory to share this morning, but I have not received one yet. Stay tuned! I will post more as soon as I hear an update. Tropical Storm Florence is forecast to be a dangerous major hurricane near the southeast U.S. coast by late next week, and the risk of direct impacts continues to increase. However, given the uncertainty in track and intensity forecasts at those time ranges, it's too soon to determine the exact timing, location, and magnitude of those impacts. With the high forecast uncertainty because of the complex weather pattern and low confidence in the long range forecast track, it is critical for everyone to remain vigilant. Although we may have a few days before serious protective measures need to be implemented, at this juncture direct impacts to NC from an extremely powerful hurricane are likely. Citizens should closely monitor Hurricane Florence and continue making preparations should emergency protective measures become required. Large swells will begin to affect portions of the U.S. East Coast this weekend, resulting in life-threatening surf and rip currents. Beach-goers should exercise extreme caution when deciding to enter the water starting this weekend. Rip currents usually peak during periods of low tide, so when planning your trip to the beach please try to avoid low tide cycles. Even though the long range forecast is somewhat uncertain, preparedness may alleviate stress and unwanted outcomes exacerbated by waiting for the forecast to materialize. Individuals should take this opportunity to evaluate their household preparedness by checking/building their emergency preparedness kit, discussing evacuation plans, validating insurance coverage, cataloging valuables, etc. With the growing probability that Hyde County will receive direct impacts from Florence, non-resident property owners should consider capitalizing on the rest of this weekend through Monday and use it as an opportunity to secure their properties ahead of the storm. This is a great time to fill up your vehicle with gas and make sure you have adequate back up fuel for vehicles and generators. If you have a generator that is new or has not been run recently, you should fill it up with gas and make sure everything is working properly. Hurricane Center for the most timely information. Recently, while enjoying dinner with a cousin/neighbor, talk turned to island barbers. We recalled at least a dozen people who cut hair, mostly nonprofessionals who seldom charged for their services. In years gone by islanders were simply accustomed to taking matters into their own hands, and doing what needed to be done. 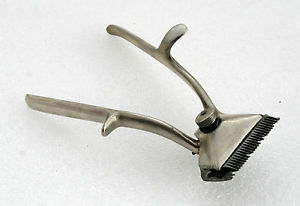 For example, my father, Lawton, routinely cut the hair of his friend Zora Bable. In turn, Zora cut my father's hair. Years ago, while working on dredge boats on the Delaware River, my father developed a reputation for doing a pretty good job cutting hair. He charged 50 cents. One day a fellow crew member wanted his hair cut, but explained that he only had a quarter. He assured my father he would pay the other twenty-five cents when he received his pay. My father told him to sit down as he brought out his clippers and comb. Dad proceeded to trim around his fellow-sailor's right ear, then worked his way up until he reached the middle of the top of his head...then stopped. "There's your quarter's worth," Dad said. "I'll finish up after you bring me the other quarter." As you can imagine, it wasn't long before Dad got his other twenty-five cents! Of course, anyone who knew my dad well knew he was just messing with his friend. He would have finished the haircut in due time. But he was enjoying the prank as long as he could. 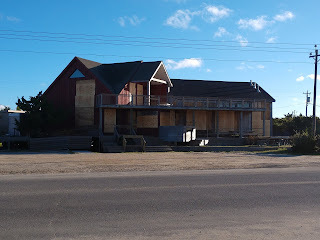 This month's Ocracoke Newsletter is the story of Mrs. Godfrey's ghost who haunts the Island Inn/Odd Fellows Lodge. The story is taken from Chapter Three of my book, Digging up Uncle Evans. You can read the account here: https://www.villagecraftsmen.com/mrs-godfreys-ghost/. During the War of 1812 the Outer Banks served an important roll by providing a base of operations for American privateers (privately owned armed ships holding a government commission and authorized for warfare, especially in the capture of enemy merchant shipping). One of the most successful privateers of the time was captain Otway Burns. Burns was born in eastern North Carolina, near the small town of Swansboro. His clipper ship, the Snap Dragon, was armed with four 12 pound guns and a pivot gun. His main base was on Bogue Banks, but he frequently anchored at Ocracoke. In his first seven months as a privateer Burns captured ten British vessels (and took 250 prisoners). He plundered the ships for one million dollars worth of cargo. In 1834 the town of Burnsville was established in the Appalachian Mountains of North Carolina. The town was named after Captain Otway Burns, a tribute to one of the most celebrated naval heros of the War of 1812. In 1909 a statue of Captain Burns was given to the town by Capt. Burns' grandson, Walter Francis Burns, Sr. and was displayed in the center of the town square.